5. We have now jumped to a height of 50,000 meters or 50 kilometers, that is more than 30 miles, and we notice a second effect of our jumps: not only are all lengths we see reduced tenfold each time, but the area which comes into our field of vision increases a hundredfold. 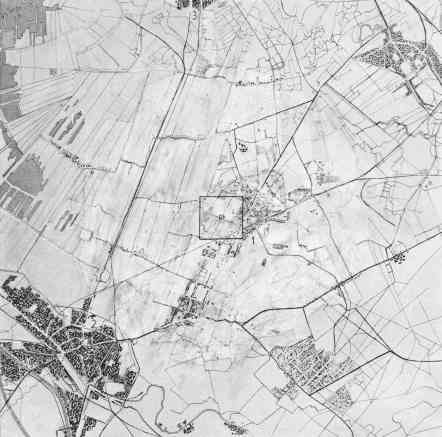 So the above illustration covers a square 15 kilometers on a side, and we see Bilthoven (1) as a suburb of Utrecht (2). A dotted wavy line symbolizes a radio wave of 298 meters wave length reaching Bilthoven from the transmitter southwest of Utrecht, called "Hilversum" after the town (3) where its studios are. The 1.5-centimeter square in the middle gives again, as it has done each time, a reduced representation of the preceding illustration. As this illustration contains a photograph of a detailed plan of Bilthoven, it just shows the houses, though very minutely.